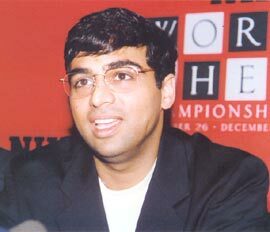 Chess wizard Vishwanathan Anand is one of the greats of the game. In the last two years, he has won almost everything that has come his way, including his third Chess Oscar, which he had earlier won in 1997 and 1998. In doing so, he became only the second non-Russian after Bobby Fischer of the United States (in 1970, 1971 and 1972) to win the coveted award. This year he already has three major crowns resting on his head -- the Corus Super Grandmaster's title, the Dortmund Super Grandmaster's title and the Mainz Classic -- and beaten all the leading players in the process. Anand, who picked his early lessons in chess at the age of six from his mother Susheela, now has his sights firmly set on the upcoming Chess Olympiad in Calvia, Spain, where he will spearhead India's challenge. The 34-year-old chess ace and wife Aruna now live in the little town of Collado Mediano in Madrid, Spain. It is no surprise that Anand, who is fluent in Spanish, is a huge fan of Real Madrid, arguably, the world's premier football club. "I like Zinedine Zidane and Roberto Carlos. I hope Zidane leads Real Madrid to glory this season and they win all the trophies," he says. Last December, Anand was conferred the Jameo do Oro, one of Spain's highest civilian awards given to a foreigner. The former World champion was at the K J Somaiya College in northeast Mumbai on September 14 to unveil NIIT's National IT Aptitude Test 2004. Contributing Sports Correspondent Harish Kotian caught up with the king of the 64 squares. You are participating in the Chess Olympiad after a long gap. You didn't take part earlier because you didn't think the format was agreeable. Could you enlighten us on that? What changes in the format would you like? You will lead the Indian team at the Olympiad. How do you rate our chances? I hope so. Like I said, it is an unpredictable tournament with an unpredictable format. Maybe we will finish among the top three. Certainly, that's what we are dreaming of. You won the Chess Oscar for the third time this year; you also won three titles this year. What have you added to your game recently? I think I have been stable. If you see my performances since 2002, I have avoided big disappointments. You may not win a tournament, but at least you play well and feel that you are on the right track. I think since Prague 2002, I have been able to do that. Also, where misfortunes have struck, like with Krishnan Sasikiran [in the 2002 World Cup] in Hyderabad or Anatoly Karpov in Corsica  or so on, I have always managed to strike back the next day and recover. So these two factors, my tenacity and stability have helped. How much time do you spend analysing positions and practicing chess? Do you practice every day? I try to, but sometimes I go a couple of weeks without any serious work. I might not look at chess at all or I might look at it for 5 or�10 minutes. Without serious work I could go for a couple of weeks, but before a tournament I try to get into that rhythm again. You are one of the best in Rapid chess. What special attributes are required to succeed in the Rapid version, where the time is restricted to as little as less than half an hour for a game? I think my performance has been good in general. I have also won two Classical tournaments, in Corus and Mainz. It looks like I am specialising in Rapid chess, but in fact a majority of the tournaments nowadays are Rapid. I mean, I am not saying that I might have won every single Classical event, but in general I have raised my game not only in Rapid chess. So I think I have just become an overall good player and I am quite consistent. World number one Gary Kasparov has not done anything much recently. You have won so many tournaments in the same time. Don't you think you deserve the number one ranking? Should there be an official championship game every year? We can already determine the world's best player every year by simply taking the tournament results. I think the Elo list needs to be brought into the modern era, because it was designed back in the sixties. It was meant for a different era. I am not criticising the thing, but I feel it is outdated. I think its time to change some things. I am aiming for 2800 Elo points. I feel it's a good goal and when I break that barrier that will be really significant. When will chess fans see the two best players -- Anand and Kasparov -- taking on each other? Potentially, it's possible next January or maybe later. A lot of young players have cropped up on the world scene. Teenage Grandmasters Arkadij Naiditsch of Germany and Sergey Karjakin of Ukraine gave some creditable performances in Dortmund. Who do you think is the best young player? It's a tricky question, because you are comparing people with slightly different ages. I would say Arkadij, Karjakin, Azerbaijan's Teymour Rajabov and Norwegian Magnus Carlsen are the players to watch out for. As I am talking, there is another youngster from Ukraine, 14-year-old Yuriy Kuzubov, who has suddenly erupted there. There are some people who are 18, some who are 14, 15 and some who are 12. But there is a vast group and I think they have a lot of talent. The youngest and most interesting is Magnus Carlsen. He is only 13 and he is already a Grandmaster. So he is very interesting to follow. What do you think of the current crop of players in Indian chess? Can you think of anyone capable of taking on the best in the world? They are definitely capable. It is just the question of playing the right tournament, practicing and constantly challenging yourself. I mean finding tournaments that are difficult for you and playing in them. It's just a question of doing that in a systematic way. We have seen Russia throw up a crop of young world-class chess players? What is different in the Russian chess scene and Indian, which also has good, young players, but who fail to strike at the top level? I think a lot of the Russians have the world's most competitive environment for chess in their neighbourhood and you can't duplicate that so easily. So, definitely, the Russians have a big lead in almost every way you choose to define in. Nonetheless, the story is slowly getting exciting for other countries. Also, the fact that you have the Internet has meant that a lot of the natural advantage the Russians had -- for instance the information they had available earlier -- is slowly being levelled. But definitely you can't beat having 50 Grandmasters in your neighbourhood in Moscow. That sort of a thing doesn't vanish overnight. So I think the Russians will continue to be a very powerful force. Do you think chess should be included in the Olympics? I would like if chess is included in the Asian Games, because that will be a nice, big step. Yes, it would be nice if chess is also included in the Olympics. But the main thing for chess right now is to finish its World Championship, get one reunified title and start looking for more corporate sponsors and try to grow the game in that way. I think that is the most important thing we can do right now. You will be 35 this December. How long do you intend carrying on? At the moment, I am not only playing because I am getting good results, but also because I am happy. It's a combined thing. Because I am happy, I am playing well; because I am playing well, I am happy. Generally I like the scene of chess. At the moment, I will say that till somebody shows me a good reason as to why I should stop, I will continue playing chess. 1985: Youngest Indian national champion at the age of 16. 1987:�The first Asian to win the World junior championship. 1987: The first Indian to earn the coveted Grandmaster title. 1991:�Won the 'Reggip Emilia' in Italy, ahead of Garry Kasparov and Anatoly Karpov. 2000: Became the 15th World chess champion. 2004:�Won the Chess Oscar for the third time.